If you need a Custom Check or Business Form you can request a quote online here. Or you may call our customer service team for a quote. 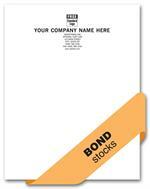 WCRLH0 Custom Smooth 24# Business Bond Letterheads Black Ink 8 1/2 X 11"
WCRLH1 Custom Smooth 24# Business Bond Letterheads 1 Ink Color 8 1/2 X 11"
WCRLH2 Custom Smooth 24# Business Bond Letterheads Black Plus 1 Ink Color 8 1/2 X 11"
WCRLH3 Custom Smooth 24# Business Bond Letterheads 2 Ink Colors 8 1/2 X 11"